Matthew Dowling: A Definition of "Born Again"
A Definition of "Born Again"
Today I want to consider the mysterious character of the new birth. We can see this mysterious quality by looking at Nicodemus’ response to Jesus’ statement that to be saved, a person has to be born again. Nicodemus asked how this could be, and compared it to a person’s going back into his mother’s womb and being born over again (John 3:4). Nicodemus had missed the point Jesus was making. Jesus was talking about a second birth that is a real birth, but not simply a repetition of the first birth. To answer Nicodemus, Jesus explains: “Flesh gives birth to flesh, but the Spirit gives birth to spirit” (John 3:6). This is a simple point, and one that Nicodemus should have known from the Old Testament, as Jesus says a few verses later. One cannot get spirit from flesh. One can only get flesh from flesh. Spiritual birth is not the same thing as biological birth. 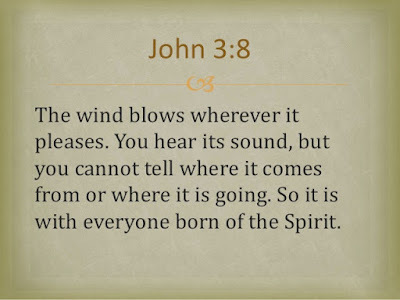 Jesus explains further by saying that the wind blows where it will. 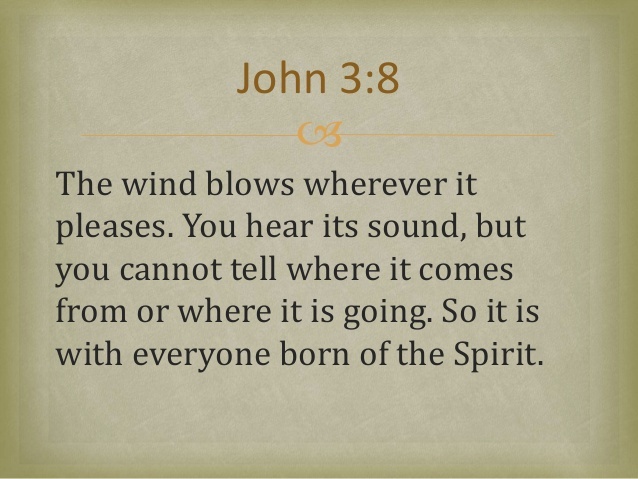 The comparison is to the Holy Spirit, who is identified as the Wind of God. Both the Hebrew and the Greek words for spirit also mean “breath” and “wind.” Even as we have no control over the wind, so we have no control over the sovereignty of the Spirit. He regenerates whomever He pleases, moving mysteriously and invisibly among men. Regeneration is invisible. I cannot see what is in your own soul, and I may not be right about my own. I may claim to be reborn when I am not; and I may not be sure I have been reborn when in fact I have been. How can I know if I have been born again? Not by simply looking back to some experience, but by examining my own life for evidence of the fruit of the Spirit. The unregenerate person is at best indifferent to the things of God. But those who are born again love God and live lives that are increasingly pleasing to Him. The Spirit is sovereign, blowing where He will. Nevertheless, we have a responsibility to be His instruments, praying for the lost, presenting the Gospel message, and supporting the evangelistic work of the church. The Spirit is faithful in His role. How can you improve your faithfulness?